American astronaut and Sen. John Glenn has died. 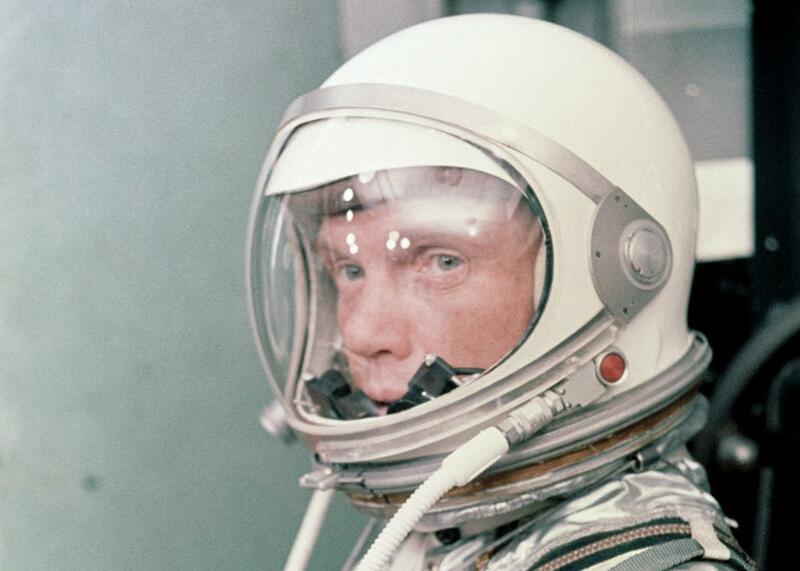 John Glenn suited up as he prepared for his historic launch in 1962. John Glenn has died. The cause of death has not been announced, but he was hospitalized at the Ohio State University Wexner Medical Center a week ago, reportedly in declining health. He was 95. To call him an American hero is understating the case. He was a military aviator, signing up after the bombing of Pearl Harbor in 1941. He was a test pilot after that, and was also a U.S. senator from Ohio for 25 years, from 1974 to 1999. But of course he is best known as an astronaut. He was in the first group of astronauts chosen by NASA, called the Original Group or, more popularly, the Mercury 7. He was also the first American to orbit the Earth, circling our planet three times on Feb. 20, 1962, in a Mercury capsule named Friendship 7. This was at the height of the Cold War and space race with the Soviet Union, and was a major step in the U.S. goal of putting humans on the Moon. Friendship 7 is on display at the Smithsonian’s Air and Space Museum in Washington, D.C., and I highly recommend visiting it. It’s tiny—the size of a very small car. Yet Glenn stepped into it when it was mounted on the top of an Atlas rocket and rode that nickel/aluminum/fiberglass can into space. The bravery of an act like that is staggering, especially given how early on it was in our attempts to explore space. But after splashdown his career as an astronaut wasn’t over: He flew again into orbit in 1998 on the Space Shuttle Discovery, making him, at the age of 77, the oldest human to fly. He lobbied hard to go and was chosen as a payload specialist by NASA. That decision was controversial; many people inside and outside NASA said that he was not “mission essential” and that his flight was political payback. Glenn himself disagreed, saying he trained hard for the flight and was qualified as a specialist. He also pointed out that there were geriatric studies that could be done on him to see what the effects of microgravity were and quite a few medical experiments were performed on him during the flight. It’s interesting to note that Glenn holds another record as well: the longest gap in time between two spaceflights for any human. Given that it was 36 years, that record may stand for some time. We’re at a time now when our first astronauts are mostly gone; Glenn was the last living member of the Mercury 7, and only seven of the Apollo Moonwalkers are still alive today as well. Even when recognizing and mourning his passing, I can’t help but think that we are at a cusp in our exploration of space, standing at the threshold of a huge leap forward in our ability to put humans into space. More countries than ever are building their own space programs with an eye toward crewed flights, and even private companies are working hard and making giant leaps in that direction. We’ve had people living continuously on board the International Space Station for more than 16 years now. We have John Glenn to thank for much of this. He was one of the pioneers, one of the first humans in all of history to leave behind the Earth, even if only for a few hours. With all of his monumental accomplishments in his lifetime, my hope is that the one he will be remember forever for is this: He helped set in motion the greatest journey humanity has ever taken, a journey that, hopefully, will never end.